Both FCDR and CDR are completely non-government funded charities. Donations can be made to us through the Donate Now button via 'The Big Give' charity website which collect donations and reclaim the tax through GiftAid for us. You just need a credit/debit card and please don’t forget to tick the box to say you are a taxpayer. What sort of money is needed to run CDR? CDR running costs exceed £70,000 a year – and are climbing in the current economic climate. Annual feeding costs for the donkeys alone amounts to around £54,000 and there are all the other bills you might expect – and some you don’t! – with the running of a donkey sanctuary. For example, it costs £75 per month just for feed and stable bedding – per donkey! So any size of donation to help with the running costs is always more than welcome. Every little helps as …. If you prefer you can adopt a donkey; please see CDR's website or simply email us on info@friends-of-corfu-donkeys.co.uk If you would like to give but have nothing spare at the moment, you may want to consider leaving a donation in your will. Please see Legacies on the Contact page. 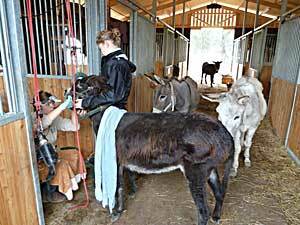 Medical supplies for treating the donkeys are always needed and welcomed. Certain permitted medications are allowed entry into Greece from the UK so if you are an animal owner, perhaps you could make your vet aware of this? If your vet has some ‘spare’ medical supplies suitable for equine treatment, please contact one of us (see Contact page) or email us at info@friends-of-corfu-donkeys.co.uk and we will get in touch with you. “I am always amazed and thankful that people from Europe come to Corfu to volunteer and most of them come back year after year, sometimes twice in one year. But that proves that the work is satisfying, the atmosphere is friendly and a good time is had by all. But I am sure that it is the donkeys themselves that bring our volunteers back, you can see when you visit that you are doing a very worth while job in very basic conditions. Some nights we all meet up and have a great night out together or a barbeque on site. Many people comment on the peace and tranquillity that can be found here with the donkeys. It is so good to slow down away from the rat race and move at a donkeys pace, cuddle the cats and walk the donkeys and dogs down to the lake. We meet the best people in the world here, visitors, students, volunteers, all like minded caring people".